Estelle Holland's work explores the voyeuristic gaze through the making of marks on skin. 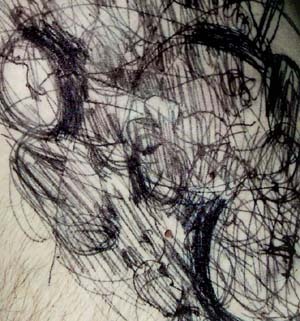 For On The Surface, Holland takes elements of the body and uses them as canvas, subjecting them to automatic drawing. Through the use of drawing Estelle Holland creates moments which force the viewer to look. Body parts become canvases, marks appear and the familiar becomes a cabinet of curiosities. Through this 'making strange', the objectified body becomes a newly neutral territory, a space in which time unfolds and drawings come to life. Working in various media from installation to animation, she creates work which relies upon a performative element; through being observed they come alive. Estelle Holland lives and works in London.